One of the world’s most widespread pests, the common rat is found all over Long Island. Also, known as the Norway rat, water rat, or common rat, they are found on every continent in the world with the exception of Antarctica. 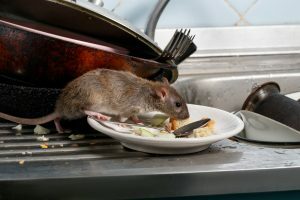 Rats are drawn to continuous food sources so they, like mice, occupy spaces where humans live and in environments that are human-made, such as sewer systems. Even though they are kept as pets on occasion, rats are dangerous to human health and their dwellings. Rats can cause just as much if not more damage than mice. Rats are infamous for helping to spread the plague, which depopulated Europe in the 14th century. Today, rats are known for carrying hantavirus, hemorrhagic fever, and leptospirosis, among other diseases, all of which are deadly to humans. Rats have even been found to have trichinosis, which causes heart muscle and lung inflammation. Rats are notorious for carrying diseases but also for destruction of property. Their razor-sharp teeth can destroy everything in their path, including hard plastics, wood, and metal. Needless to say, rats can easily chew through the drywall, insulation, and electrical wiring in your home or business. The structural damage that can be caused would be catastrophic to any home, much the less the fire hazard caused by chewed up wires and cables. Get rid of any rat nests in your home by calling the rat extermination specialists at Twin Forks. Protect your family, your home, and business by getting rid of rats today. Our rat control specialists guarantee their work so you don’t have to worry. Twin Forks Pest Control operates east of Riverhead, so whether your home is in Cutchogue or Quogue, we are available to get rid of your pests. Give the experts at Twin Forks Pest Control a call today at 631-287-9020 to schedule your free estimate.